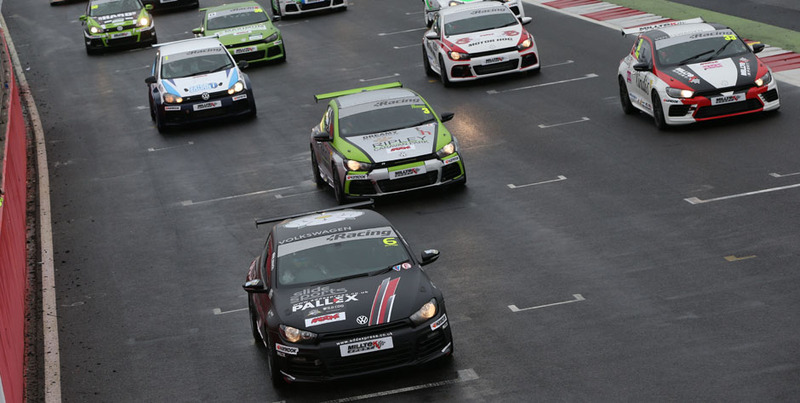 Reigning champion Joe Fulbrook and his Safe and Sound-backed Golf GTI mastered the tricky wet conditions at Silverstone this morning to score their maiden win of the Milltek Sport Volkswagen Racing Cup season. 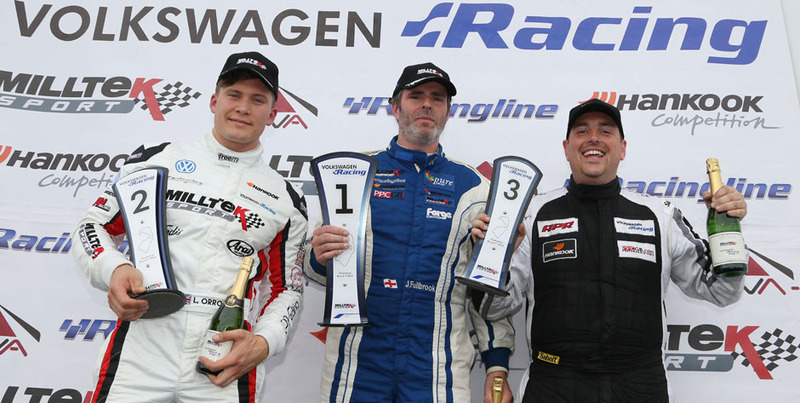 It was Joe’s first wet-race victory since 2009 and the first of the year for a Golf after six successive Scirocco triumphs. 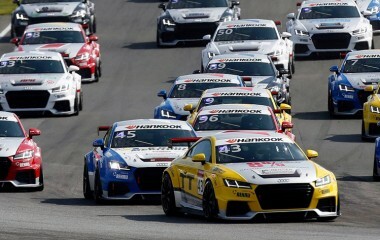 Fulbrook took command on the fourth of six laps around Silverstone’s 3.7-mile Grand Prix circuit, championship leader David Sutton having led initially before handing the baton to Lucas Orrock. 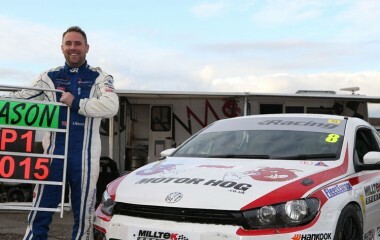 KPM Scirocco driver Orrock held on for second place, his best finish of the year, ahead of Phil House, who made it to the podium for the first time in nearly two years. Dry and sunny weather for Saturday’s qualifying session meant that all 29 starters were running ‘best-guess’ chassis set-ups for the vastly different conditions of the race, and Sutton, who led the length of the opening lap, thereafter found his SlideSports Scirocco a handful. Orrock, who made up two positions on the opening lap to slot in behind the leader, took advantage of Sutton’s discomfort at Village on lap two, with David pushed back to fourth by the end of the lap by Aaron Mason’s AWM Scirocco and by Fulbrook. Fulbrook’s Golf was clearly handling better than all the Sciroccos around him, and Joe seized second place from Mason at Club on lap four and then drove around Orrock for the lead at Brooklands later the same lap. “Joe came up on me and there was no point in trying to resist him,” said Lucas. Sutton was pleased to retain fourth at the line, and with it his championship lead: “We struggle a bit in the wet; the set-up isn’t quite right and we have some work to do. I had no grip until the final lap, but overall I’m pleased with that position.” Mason recovered from his off to take fifth. Rockingham double winner Jack Walker-Tully endured a disastrous qualifying session with a too-heavy Scirocco and started from 12th. With ballast shed for the race he made up four places on the opening lap and was delighted to make it into the top six by the end to net himself pole position for the reverse-grid second race. 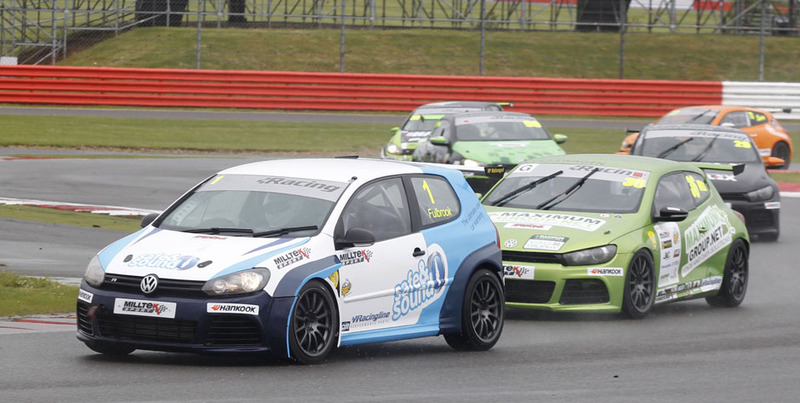 Tom Witts, the current Mk 2 Production Golf GTI Championship leader, enjoyed a strong VW Cup debut to finish seventh in the Maximum Motorsport Scirocco, with Robert Barrable close behind on what was his first outing of the season in the THM Racing Golf. 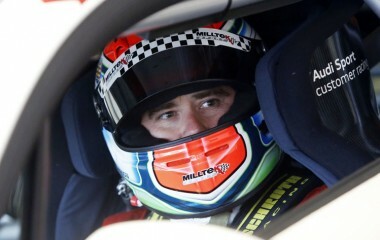 “We tried something with the set-up which didn’t really work and went backwards after a strong start,” said Rob. Chris Panayiotou (SlideSports Scirocco) followed Barrable home for ninth, with Darrelle Wilson 10th and the leading Team HARD finisher. Graham Ewing took 11th place in his SlideSports Golf, claiming the Sportsman’s Trophy for the second race in succession, with Mark Smith scoring his best finish of the season so far, 12th in the InFront Motorsport Scirocco, ahead of Pete Littler (JWB Scirocco), Simon Deaton (Maximum Scirocco) and Paul Dehadray (JWB Scirocco). The youngest driver in the race, 16-year-old Damani Marcano, was another to score a personal best: 19th, just ahead of his Team HARD comrade Laura Tillett, who had to start from pit lane after power delivery problems on the warming-up lap. HARD runners Simon Rudd, Howard Fuller and Bobby Thompson were also in the wars – Rudd was tagged, spun and lost time before restarting to finish 24th and last, while Fuller and Thompson were both sidelined with mechanical issues. 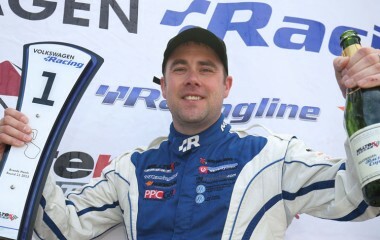 They were joined in retirement by Simon Andrews and Lee Christopher, who came together on the opening lap after Christopher locked up his SlideSports Scirocco at the treacherous Stowe corner.